The Office of Sustainability has partnered with Indiana Pacers Bikeshare to provide free access to the city’s bike share program for the Knozone Action Day on Wednesday, September 19, 2018. Bicycles are a sustainable form of transportation which positively contributes to our city’s environmental footprint. Pacers Bikeshare is a healthy, convenient and reliable form of transportation that can be used to replace vehicle trips on any day. Using Pacers Bikeshare on Knozone action days is an easy way to reduce ground level ozone. During a Knozone Action Day, the air quality may become unhealthy for sensitive individuals, especially active children, the elderly, and anyone suffering from lung disease or other serious health problems. Sensitive Groups throughout Central Indiana are encouraged to reduce prolonged or heavy exertion outdoors on Knozone Air Quality Action Days. “Knozone season” in Central Indiana runs from March through October, as ground-level ozone is more prevalent during the warmer months. Among the many ways residents can reduce their contribution to ground-level ozone with their actions, residents can utilize the 250 bikes at the 29 Pacers Bikeshare stations across Indianapolis and use Pacers Bikeshare for free as an alternative mode of transportation on Wednesday, September 19, 2018. 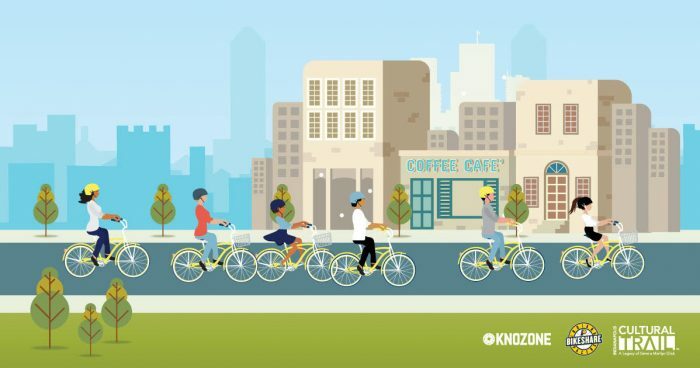 No promotional code is needed to gain free access to Pacers Bikeshare on September 19, 2018 Knozone Action Day. Individuals wanting to take advantage of free access to Pacers Bikeshare, can do so by checking out a bike at any of the 29 stations located on or near the Indianapolis Cultural Trail. A credit card must still be used when checking out a bike and usage fees for trips over 30 minutes will still apply.